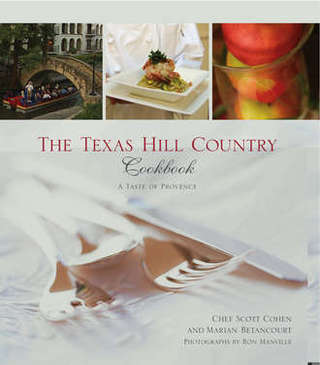 The Texas Hill Country Cookbook: A Taste of Provence (Globe Pequot Press, 2007). While traveling in Texas, I met Chef Scott Cohen who loves the Texas Hill Country because it gives him access to the same king of fresh local food he found in Provence where he trained. Foodies will discover there is more to Texas than BBQ and Tex-Mex. Chef Cohen now directs the cuisine at Pavil Brasseries in San Antonio. "There is no need to cross the Atlantic anymore to enjoy the herb-scented cuisine of Provence. In this appealing book, Scott Cohen brings these intense flavors and his own sophistication to Texas Hill Country cooking." Other plaudits came from Southern Living Magazine, Texas Monthly, San Antonio News Express, Fort Worth Star Telegram, Associated Press, and many chefs. "Possibly the single best resource." Now available as an e-book for $4.99.